Through the whirlwind of time, few traditions remain that truly define the American character than our penchant for skillful shooting. Today, as our beloved country is torn between believers and non-believers of traditional American values, OnTarget Range stands resolute as an unwavering bastion of our constitutional rights, therefore representing the very fabric of our American culture. On the surface, we may appear as an establishment engaging in commerce…but within the spirit of OnTarget exists a higher calling to outfit Americans, train Americans, and provide Americans with an exceptional indoor range where they can practice the timeless skill of marksmanship. Clean and well-ventilated, our 20,500 sq. ft. indoor range offers a 12-position, 25-yard Pistol Range, a 12-position, 50-yard Rifle Range, a Retail Store, and Classrooms. Everyone is welcome at our range, from first-time shooters, seeking a place to develop their fundamentals, to seasoned experts looking to maintain or improve their skills. OnTarget Range acknowledges and appreciates all customers who support both our facility and shooting sports in the community. Member or not, you can come with nothing and we will outfit you for your time on the range. 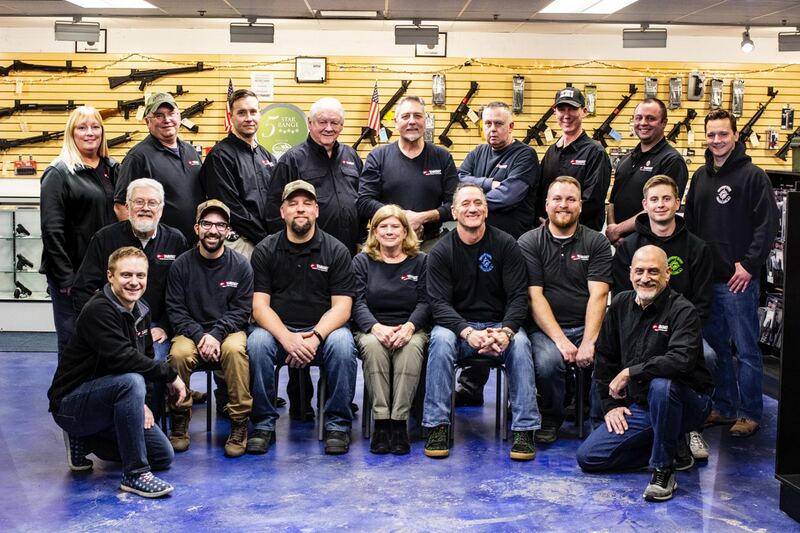 Whether you are using the ranges or attending a firearms class, our goal is for all customers to have a safe and enjoyable shooting experience at OnTarget. We are located at 560 Beechcraft Lane at the end of Knaack Boulevard off Route 176 in Crystal Lake. Can’t find us on your GPS? Search for Rte. 176 & Knaack Blvd. Turn into the business park at Knaack Boulevard and drive north to the end of the street and you won’t miss our facility. OnTarget, the first and only indoor shooting range in McHenry County specifically designed and constructed as an indoor shooting range, contains the latest, cutting edge safety, health, and targeting technologies to ensure a top notch experience. OnTarget Range houses two classrooms, including one large classroom that accommodates up to 30 class participants. Our classes are designed to accommodate a wide range of skills from first time pistol shooters to those seeking training in all firearm systems at the expert level. Don’t have time for a regularly scheduled class? Give us a call and we will set up a block of private instruction for individuals or families on any firearm of their choosing. The great part about private instruction is that it is designed for your convenience. Although membership is not required to enjoy all the facilities at OnTarget Range, members receive special benefits. These include reduced rates on the range, priority scheduling, four guest passes per year, and a discount on any FFL transfer. To take advantage of our membership perks, join now! Complete your membership application on-line or come to the range where someone will assist you. Planning to reward your employees in a “ballistic” sort of way?. . .Or how about a surprise party for the shooter in your life? Since our range opened in 2012, OnTarget has hosted over 300 corporate or group events in our “John Wayne” room. We can facilitate your vision of a perfect party where your group can have a private instructor who will offer instruction on any firearm(s) you wish. *We can also offer catering for any function! For details on corporate group outings for any size event, please email: Tom@ontargetsite.com or call 815-477-2020. From the war-torn streets of Beirut to the jungles of Colombia, Tom Dorsch has protected dignitaries worldwide since 1985. A former Marine and Special Agent of the U.S. Diplomatic Security Service, Tom has served as Agent-In-Charge for several high threat U.S. Ambassador protection details. As Training Director of VIP Protection for the U.S. State Department Office of Anti-Terrorism, Tom and his team of instructors have trained dozens of international presidential protection details. In addition, Tom has served as the U.S. Security Advisor and Firearms Instructor for the protection details of four foreign presidents throughout the world, and has authored three books.